As more customers take their shopping online, the CIO plays a large role in making sure customers have a consistent experience no matter where they are shopping and that they don’t see any barriers between shopping location. In Lucky’s case, customers could be on the website, in a dedicated Lucky store, or at a partner department store, so Jason and his team ensure the technology is the same and that employees can provide customers with the products they need. This includes making sure the company has the best technology to track inventory, accept payments, and communicate with customers. If a customer purchased a product online but wanted to return it in store, as is very common in today’s world, the company needs to have the right technology to make that transaction possible. Without proper systems and employee training, customers could be left with a frustrating situation and no way to change it. 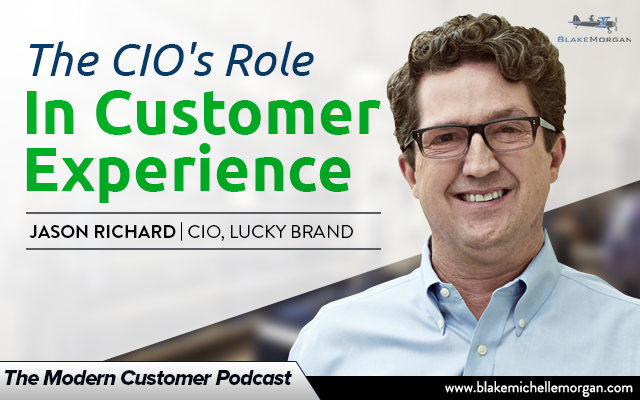 The CIO’s job is to deliver on capabilities to make the customer experience great. The role of the CIO has already changed, and it will continue to evolve as technology and the customer experience changes. The focus going forward isn’t simply on making sure computers work and the lights stay on, but rather on delivering on ROI and using technology to make a strategic impact in the company. CIOs can’t sit back and wait for other business leaders to come to them with needs of the organization—they must get enough pull behind them that they can innovate and proactively put the right technology in place to drive the organization forward and build a strong customer relationship. In order to do that, CIOs need to be aware of their business, the industry, and the latest technology. In a world filled with evolving technology, customers expect a strong tech-based experience. The CIO can implement changes to greatly improve the customer experience and stay ahead of the technology curve.